No Man's Land? : Cochin Metro: Essential or Extravagance? Home Railways Cochin Metro: Essential or Extravagance? The Lords in New Delhi have finally given a green tick against one of the major infrastructural developments planned for Cochin: The Metro Rail. So, who wants the Metro? Well, end users, as always...I mean general public. And obviously the businesses... An MRTS is a huge fillip to a city's image in addition to the benefit of quick and efficient transport. A Metro line can meet the travel demands of the city for decades without significant expansion in its basic infra. It is expected to reduce the pollution in the city by the virtue of the no: of automobiles it takes off the roads. It improves the quality of living and provides more value to the most priceless commodity: time. Throw in the advantages such as creating employment to a few hundreds and ushering in development to new & outer areas of the city, one immediately visualises the positives of the system. In an assessment made by Delhi Metro Rail Corporation, which is the consulting agency for the Metro project in Kochi, in 2011 there will be 13,681 travellers in an hour in one direction in the area under the Greater Cochin Development Authority. The peak hour estimates are 38,187 travellers in 2011, when the metro project is likely to be completed. Now the million dollar question is: Is such a heavy-duty project an inevitability for a mini-metro like Cochin? So far, MRTS has been the choice of transit only if the city feeds over 4 million souls, as per Indian standards. Before you zoom in on your verdict, I'd like to invite your attention to another small, neat city on the other side of the sphere: Dublin. Dublin is lovingly addressed Europe's favourite small city. This is the city which has been my home for the past 3 years. It pales in comparison to the other regional heavyweights like London, Zurich, Paris or Berlin. With a population of just over a million, Dublin is no bigger than any major Kerala city. It has a Port smaller than Cochin but prides itself in the bigger hub-airport. The streets are traditional, architecturally rich, orthodox, pretty and congested but orderly. Dublin shows off a pretty impressive motorway network spreading out like a spider's web from various focal points of the city and hosts a 6-8 laner ring road, the M50. Now whats so impressive about Dublin is the awesome public transport system the city has developed. (Refer the figure below) The wide and extensive road network is very well complemented by the exhaustive and exclusive BRTS system which is cheap and efficient. 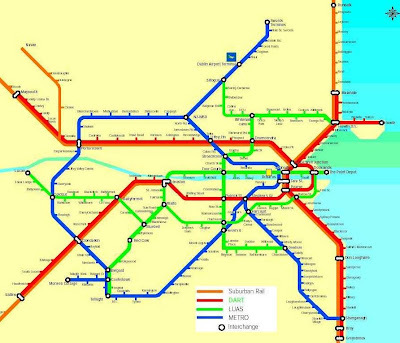 The sub-urban rail service or DART (Dublin Area Rapid Transit) (red)covers 3 different corridors and is punctual and quick. Dublin has resuscitated their old tram network(green), christened luas, and this services the residents on 2 different corridors. Luas has become the new face of Dublin, is hugely popular, trendy and punctual. And if that's not enough, Dublin is racing to the finishing point with their latest showcase: the Metro(blue). This extensive and interlinked public transport system ensures that there are at least 2 different options available for a Dubliner on every corridors in the city. And hold on! This apparently small city has been credited by GaWC as an Alpha world City, pipping the likes of Los Angeles, where public transport is almost non-existent. It might be unfair to compare a European capital to a third world city, especially since we're talking about big money here...really big money. The Cochin Metro is expected to cost the exchequer a dear 3000 crores for 25odd kilometers, roughly 125 crores/ km. And the frowns are yet more prominent with the fact that only 2 metro-systems in the world manage to produce green on the balance sheet. So why are we speaking about such elaborate plans when there are, apparently, cheaper and better options? Ok, lets dig a bit into the history of this proposal. The idea for a Metro system for Kerala's financial capital came from the most recognizable voice in Indian Railways: DMRC Chairman E. Sreedharan. He also considered the feasibility of the system in Trivandrum but the undulating terrain in the Capital rendered it unsuitable. He suggested a BRTS for Trivandrum for which actions are initiated and also a LRTS which would be more suitable for the city. (I've put my ideas about Trivandrum LRTS here, if you want to check out). Coming back to Cochin, the city also featured an added advantage of having highly urbanized and industrialized Municipalities merged physically to the Corporation body. 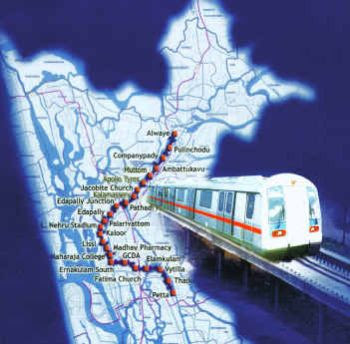 Cochin Metro is envisaged to pass through 4 urban bodies, the Corporation of Cochin and the suburban towns of Alwaye, Kalamasserry and Trippunithura. The combined population of these urban bodies and immediate suburbia may well cross 2.5 million, which theoretically still fall short of Indian benchmarks for a Metro. If ever someone formulated a Transport 2025 policy for Cochin, then widening of those roads must become the utmost priority. Easier said than done in Kerala, eh? Ernakulam district has the highest length of 4-6 laned roads in Kerala but they're still strangulated all day long. Widening of roads is like having a bigger seat belt to treat obesity, you'll reach nowhere if you don't have alternate transit methods in place. I'm sceptical of the success of systems like BRTS in Kerala, provided our road and driving culture. Also a BRTS could in no way replace a MRTS; its like a belt and a tie...both essential for a good pro outfit but one cant replace the other. Now there is a solid proposal for a suburban rail service on the lines of one in Mumbai. Good one there, but again the existing rail lines are a bit dissociated from the main urban conundrum of Cochin (except for a small stretch). It still may not be good enough to take the pressure off the roads. What about the light-rail options? No, according to Mr. Sreedharan. Because something like a Monorail, although a lot cheaper @ 40 crores/km, has a far inferior carrying capacity and has a maximum speed of 50km/hr. Also, the technical snags experienced with those Monorail in Goa must've left a bad taste in the mouth. Personally I feel its a waste of time searching for other options since the industry experts have given the green signal to the Metro. 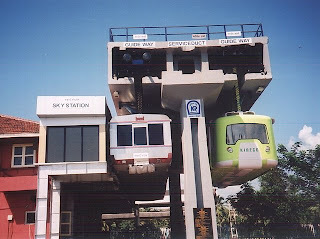 Perhaps we could think about an LRTS system to connect the two points of the Metro via Kakkanad, in future? I'm curious to see how they propose to break even such a massive project. If it is taken up as a PPP project then it would be interesting to see who comes forward to build and operate it, and how. If someone is confident about making the ends meet, then double thumbs up!! Also with Kerala's notorious history of long gestation periods and even longer implementation time for her projects, I believe it makes sense speaking about the Metro now itself if we wanna see it running in 2025! True, transportation or infrastructural projects mustn't always be envisaged with profit in mind, you reap the real benefits after a decade or two,perhaps. So there! Its a delicately balanced scenario... Service vs Profits. Well, whats your pick?